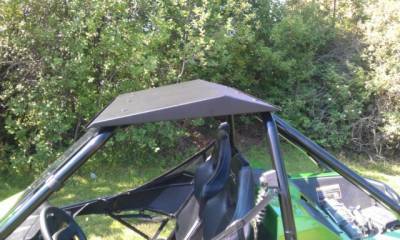 Arctic Cat Wildcat 1000 Aluminum Top Fits: 2012-15 Wildcat 1000 WILL NOT FIT: Wildcat Trail (50" Model) Laser cut and CNC formed for a great fit. Powder coated texture black for superior protection. Mounts with rubber coated straps to protects your cage. Nearly 1/8" thick 5052 Aircraft Grade Aluminum. Front and rear rain gutters. Protect the driver and passenger from the rain and sun with this stylish aluminum top. Made from nearly 1/8" thick 5052 Aircraft Grade Aluminum. Laser cut and CNC formed to ensure a great fit. Rain gutters on the front and rear channel water off the sides instead of on your lap. NOTE: The front and rear are the same width. The picture looks like the rear is not as wide, but it is an illusion.